What Leaders Do is a brief explanation of the six primary areas of activity associated with Christian leadership in the Church. Developing Skills for Church Leadership is associated with knowing these six primary areas of activity. Kenneth O. Gangel wrote: "Churches, mission boards, colleges and seminaries, parachurch organizations and scores of other Christian organizations suffer in these crisis times because of misleadership. Not because of bad people. Not because of laziness. Not because of insufficient funding. Not becauser their contribution to the Kingdom is not needed. They suffer because of ineffective leadership." Gangel also defined church leadership as: "The exercise of one's spiritual gifts under the call of God to serve a certain group of people in achieving the goals God has given them toward the end of glorifying Christ." In light of his definition of church leadership and the ineffective leadership in many Christian institutions, Gangel outlined in an article six primary areas of activity that enables a church leader to fulfill his calling. The following is a brief overview of those six primary areas of activity. Leadership is not synonymous with management and administration. Leaders need to be good managers or administrators. After all, leaders are responsible for the resources available to them. However, leadership focuses primarily on human resources. Leadership is about the way we treat people, develop people and relate to people. Leaders relate to people through relationships. These relationships enable leaders to achieve the goals and tasks assigned to them. John Maxwell notes these relationships. I Model - I do it. I Mentor - I do it and you watch me. I Monitor - You do it and I watch you. I Motivate - You do it. We Multiply - You do it and train someone else. Leaders must be able to organize themselves, that is, they must be able to manage themselves. Organization paves the way for time management so that you get time to do the things you need to do. There are thousands of things to do each day. But there are things that must be done. They have priority. If you organize according to priority, then you will do the things that need to be done and have time to do other things. Leaders organize their life, their church and their job. Leaders achieve through setting goals or objectives that stem from the mission statement. Furthermore, these goals or objectives must be converted to specific targets and assignments. Gangel wrote: "Someone once suggested that Leaders face four tasks: to fulfill the goals of the organization to provide for innovation, to involve other people and to sustain personnel morale. In my view, if the first of those goes awry, the rest do not matter." Leaders acheive the goals or objective set for them. Leaders think by cultivating the skills of observation, fact gathering, reflection, reasoning and judgment to arrive at solutions in order to advance the cause of the organization they serve. In many ways, to think is to learn. Wise leaders think and plan together. It's not about competition but cooperation. Leaders envision by setting the direction of the organization with their mission statement. The statement must be simple enough to be remembered and specific enough to give direction. The mission and vision of your organization must be based on your specific ministry. "Why has God raised up this ministry in this place at this time and what does He want?" Wise leaders do not replicate someone else's mission and vision statement! 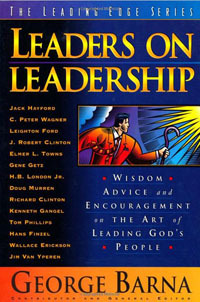 "Effective leaders stay in a ministry as logn as necessary to get the job done. The ability to plan, to make decisions and to envision a ministry's future requires a willingness to see yourself in the scenario for a long time." (Kenneth O. Gangel). "If followers wee you as interim, short-term, or even a career climber who considers a present post only temporary, they will defer their interest in following and shy away from involvement in team leadership" (Kenneth O. Gangel). To read this article by the original author, click on the following link What Leaders Do.